Albin Counter-Gambit a3 and Nbd2 - Chess Gambits- Harking back to the 19th century! The idea of a2-a3 is simply to prevent ...Bb4+ and prepare a queenside attack with b2-b4-b5 in some variations, which is especially designed to combat Black's ideas of queenside castling and kingside play. The idea of Nbd2 is often to play Nb3, rounding up the pawn on d4. These lines are generally considered to be the most critical test of the Albin Counter-Gambit these days. Black has ways to get counterplay, and ways to emerge out of the opening with no more than a slight theoretical disadvantage, but achieving both of those is a much greater challenge. 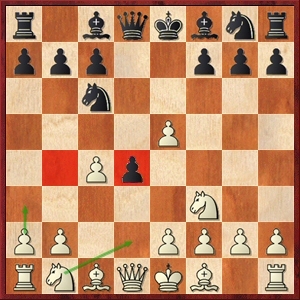 Against this, 5...Nge7 often leads to considerable complications, as demonstrated in a number of Alexander Morozevich's games, but has the downside that White has ways to try to return the pawn and simplify the position with the aim of nullifying Black's counterplay. In particular, I don't like the line 5...Nge7 6.b4 Ng6 7.Bb2 a5 8.b5 Ncxe5 9.Qxd4 from Black's point of view, as was recommended by Kiril Georgiev in his book Squeezing the Gambits. 5...Bf5 is also playable, after which Black meets 6.Nbd2 or 6.b4 with 6...Qe7. This blocks in the f8-bishop but puts some pressure on the e5-pawn, while Black can then defend d4 with a rook after castling queenside. However, White has a couple of promising options, such as 6.b4 Qe7 7.Nxd4 (where I'm not sure that Black gets enough for two pawns) and 6.e3 dxe3 7.Qxd8+ Rxd8 8.Nc3, which is slightly better for White. Black can refine this idea with 5...Bg4 6.Nbd2 (not 6.e3?! Nxe5) 6...Qe7. Then White should kick the bishop with 7.h3, and after 7...Bh5, generally allows Black to regain the pawn but strives to work up queenside attacking chances, e.g. 8.g4 Bg6 9.Bg2 or 8.Qa4 0-0-0 9.b4 Ncxe5 10.Nxe5 Nxe5 11.Bb2. The main alternative for Black is 5...Be6, after which play typically becomes complicated, e.g. 6.Nbd2 Nge7 7.Nb3 Nf5, in which Black's practical chances are quite good, although objectively White should have some advantage. White's important options here include 8.g3, 8.g4, and 8.Qd3. This move-order trick is mainly aimed against 5...Nge7, after which 6.Nb3 Nf5 7.e4 makes it hard for Black to avoid accepting a trade of queens down the d-file, whereupon Black's better pawn structure only offers partial compensation for the pawn. Black can keep the queens on with 7...Nh4, but then simply 8.Nfxd4 is good for White. 5.Nbd2 is also effective against 5...Bf5, since after 6.Nb3, a subsequent Nb3xd4 will hit the bishop on f5. Then 6...Bb4+ 7.Bd2 Qe7 (7...Be7 is met by 8.Na5!, as per Justesen-Anderson, email 2011) 8.a3 Bxd2+ 9.Qxd2 is better for White. Black can, however, try either 5...Bg4 or 5...Be6, after which White has nothing better than 6.a3 transposing to the lines following 5.a3 and 6.Nbd2. Both are better for White with best play, but give Black some counterplay. Thus, I am not convinced that 5.Nbd2 is objectively any better than 5.a3, but it has the advantage of narrowing down Black's good options, since after 5.Nbd2, both 5...Nge7 and 5...Bf5 look suspect to me.